Most working individuals long to take some time off and destress there are those who manage to go off for a week or two in a year and then there are those who are either too scared to ask for a day off or who just want to save up their leaves. You can be in any one of these categories but since you are reading this it is more likely you are in the fourth category which wants to take leaves but doesn't know how to go around and ask for them. We get 18 days of Annual earned leave, 7 days each of casual and sick leaves for a total of 32 days in a year. Looking around the world it can seem a good deal, or too less. France is known for weeks of off days while it is more of a norm to hear about 10 days of paid leave in US. If you get only 10 days off a year and you want more (naturally!!) you have a lot to do which may involve changing your job. More often than not it is quite possible to get a few days off to go and visit a close by destination. Actual problem is when you want more than a couple of days off to visit a place far away. 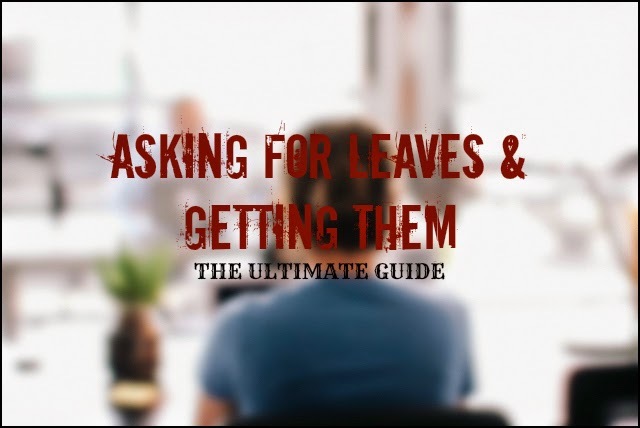 Here's a guide on how to get those leaves without becoming a liability for your boss. All of us have a certain number of leaves we can take in a year defined in our contracts or through company policy. It is very important for you to know what types of leaves you can take and under what requirements. Most offices allow you to call in sick for a day or two without a note from your doctor. While many restrict you to club sick leaves with annual paid vacation time. To use your leaves and avoid friction in office it is important you know what you are entitled to. There might be a case where your boss would let you combine a few things at her discretion but it is better to never bet on it. It goes without saying that unless you work well your interests will never be considered important by the company. But there is a catch, if you do not delegate responsibility well and become the only person who knows about something, it will be difficult to get days off. Being a part of the team and contributing in it always pay off. If you do see people getting days off easily even if they are the slacking at their jobs, don't go on a tirade about it. Every employee is allowed to maintain their own kind of relationship with the employer and it is better to improve your's without commenting on other's. Do not make it a habit to stay late. Not only is it detrimental to all other employees it is not sustainable. If allowing you take a week off means the employer looses one and a half worth of work guess what you are going to find it really difficult to get leaves. We as architects have really weird schedule and are known to work huge number of hours a week. After my first office I realized it is not just possible to finish work in prescribed hours it is also difficult to get leaves when you are in office 12 hours a day. It doesn't matter if you are a bachelor or you have nothing to do, get out on time and find something to do with your life. To get the days you want it is important to know what days you want off. It might not be fair to other last minute planners but if you are the first person to declare your intentions there are high chances of your leaves not being declined. I know what you are going to say, I can't decide so much in advance, my wife has to finalize or my friends can't commit or what ever... Guess what mate, if you want a smooth leave approval it is better to know what all days you want off WAY in advance. And as far your friend are concerned ask them to commit now if they can't their loss. There are many benefits of advance planning and if you are not filthy rich you should be doing it anyway. Still not convinced sign up for the next post which is about how and why of planning. Great you now know by the 10th of January what all days you are going to take an off do not go and vomit the information on your supervisor. It is a strange psychological response to deny anyone who is asking for multiple things even if it is all justified. If you do not believe me think back to your childhood days when your mom would happily give you one thing but as soon as you got greedy and started asking for more, in a few cases she would even take the one she gave you back. A good time is around 3 months for a week long holiday and a month or two for a couple of days or a long weekend. If it sounds way ahead of schedule and you worry that your supervisor will forget write a mail after verbal approval and ask her politely to confirm. That way even if your supervisor forgets you have some proof that you did inform them. We put up a calendar of our future leaves marked at our bosses table. If he forgets we just point to it. Around two weeks before you are about to leave inform people concerned of your impending absence so that they cna clarify their doubts and priority work can be finished before you go. This will also make sure that there are less people looking for you when you are vacationing and you work will be in a better condition when you come back. There should never be a situation where your boss calls you up asking where you are and you remind him of your leave starting today. I have seen people lying to get leaves and if you are travelling in that time there are high chances your boss will know you lied. Pictures are almost every where on the internet and if one person form your office knows there are chances everyone knows. This is never good for any professional relation ship. Also remember these leaves are within your right you should not have to lie. If the only way to get leaves in your company is a health or family emergency rethink if you want to be working there in the first place. Here's and Infographic showing how exactly to get what you want... leaves. If you want a day off and you are entitled to it there is no reason your company can stop you from taking it. If every day off is met by a veiled threat of being fired go to the last line of the previous point. As with any professional negotiation it pays to be firm. Remember you are just asking for a few days off maybe a week or two, and plan on coming back and working with the same people. Being firm about your requirements does not mean you have to be rude or wave regulation in their face the moment you get in the discussion. Be civil and remember you are going to be working with these people even after you come back, there is no need to add strain. Can you be reached by phone or you will be off the grid? Can you and will you be working a few hours a day even if to reply to a few mails? All of these questions need to be answered if you are going off for a week or so. It is always better to inform relevant people you are not sure about connectivity and might not be available, if you are not sure you will be able to entertain any work related phone or mail. put up the out of office reminder so that your clients and colleagues know you will not be replying to them and they should approach someone else. This for one will help you get leaves in future much easily. Unless you get stuck in some unavoidable circumstances or weather plays a spoil sport be back on the day you promised to be back. When you flippantly take additional days off your boss is definitely not going to be happy and in most cases will inform you in no uncertain words. If you are coming in late inform, if you are stuck or need another day call up and inform your boss if not you team. If you don't want to do that be there on the day you promised. More often than not above pointers will get you the leaves you want. Remember every culture has a different view on days off and travelling, most of the old time views are not in our favor. It is our responsibility to train our employees and when our turn comes be generous with our employees. No one should be forced to work on days they don't want to. Unless there is a life and death situation let people live their lives you will have a place people will love coming to. If you found this post helpful help other out by sharing. Hopefully it is, The question I get asked most is how do you get leaves... Well this is how!